Overview: We know you like to browse the web when you’re on the go. That’s why Opera Touch features a fast web search and is designed to make it easy to browse with only one hand. 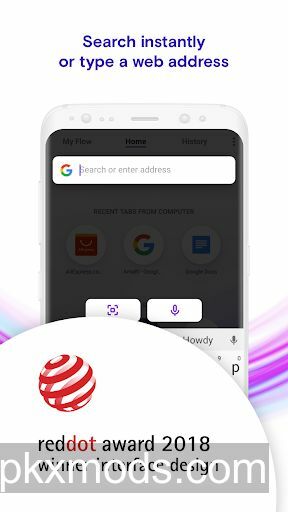 When you start Opera Touch, the browser is instantly ready to find things on the web. Just start typing or use voice search. When you have found a QR code, simply use the app to scan it and go to the website it links to. You can also use Opera Touch to scan a barcode on a product and to look it up online. Opera Touch lets you explore the web using just one hand. The Fast Action Button is always available on your browser screen and gives you direct access to your Instant Search. You can also hold and swipe the button to switch to your most recent tabs, reload, close or send the current tab to your computer. Use Opera Touch together with your Opera computer browser for seamless web browsing across your devices. Connecting your phone with your PC has never been easier. Just start the Opera PC browser and scan the QR code displayed there with Opera Touch. No login, password or account needed. You can now send links, videos and notes to yourself with a single click and they will be displayed across your devices. Opera Touch employs the very latest in web technologies to keep you safe. The data you send in Flow is fully end-to-end encrypted. The browser also features Opera’s cryptojacking protection, which reduces the risk of your mobile getting overheated or running out of battery when you browse the web. Opera Touch features an opt-in ad blocker. When turned on, the browser will block intrusive ads, making web pages load faster. In this version, we have improved stability.